There have been a few horror movies that have caused a paradigm shift in popular culture’s consumption and attitudes toward horror films. There were the early monster horror films, primarily courtesy of Universal, in the early 1930’s. There was science fiction horror in the 1950’s. Then, in 1960 there was Psycho, and a few other of Alfred Hitchcock’s self-proclaimed “healthy” horror shakeups. In 1968 Night of the Living Dead [review here] terrified a new generation of youngsters hoping for a sci-fi monster movie. 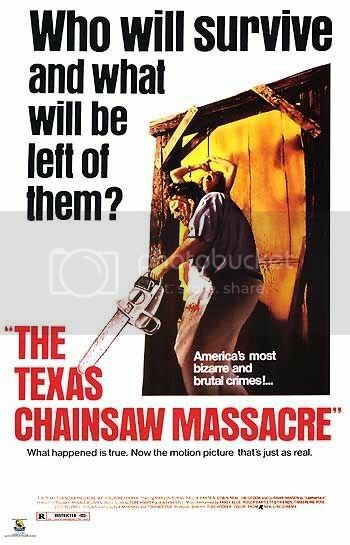 In 1974 the genre became even more adult with the appearance of The Texas Chain Saw Massacre. No film had yet had such an impact on the national psyche. This was before Cannibal Holocaust caused people to believe the primary cast had been murdered during filming. This was before The Blair Witch Project had audiences thinking it really was footage found in the woods. This was a story so terrifying that it absolutely had to be based on a true story (even if it was a loose composite, in reality). This was a story told in a way that would scar generations of movie-goers, and one that will continue to have an impact despite a low body count and a shocking lack of blood. 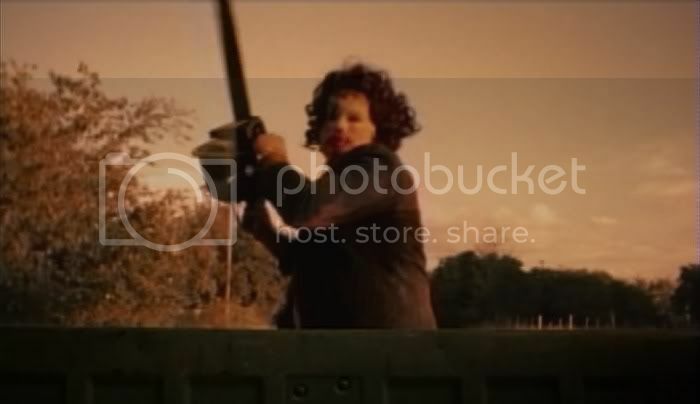 The Texas Chain Saw Massacre is not just an early example of gritty low budget horror. It is an unbridled look into the depths of madness. The film itself dissolves into chaos about halfway through, and continues its descent until the final frame. In doing so it becomes one of the rawest, most terrifying horror films of all time. It offers a look into the human condition that many people (primarily non-horror fans) may not want to see, but the film is a worthwhile experience for horror fans looking for depth with their terror. The plot is simple, and has been imitated by nearly every subsequent horror film. A van full of young adults is traversing the Texas landscape. Many of them are hippies, in a broad sense of the term. 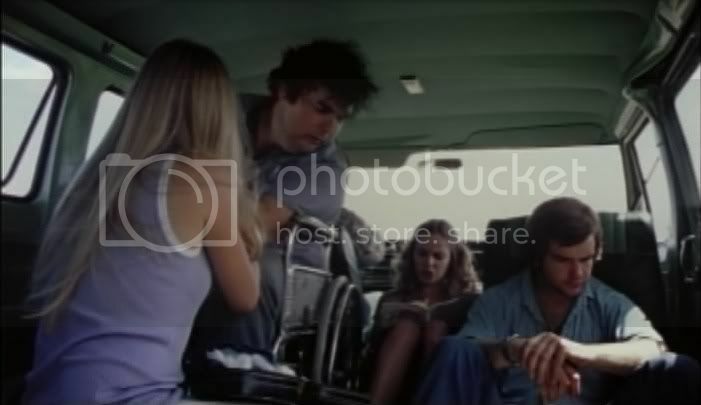 Franklin (Paul Partain) is the most unique, primarily because he’s in a wheelchair. He’s also the most outspoken, and is unafraid to complain constantly. He’s accompanied by his sister, Sally (Marilyn Burns), on a trip to visit their grandfather’s house out in the country. Sally’s boyfriend Jerry (Allen Danziger) is along for the ride, as well as another couple. Kirk (William Vail) and Pam (Teri McMinn) are primarily backgrounds characters, and are the first to enter the lion’s den. After a bizarre encounter with a hitchhiker (Edwin Neal) at the site of a grave-robbing, the quintet eventually reaches the house. It is dilapidated and uninteresting, but some of the adventurers aren’t as interested in the house. Kirk and Pam go off for a dip in the local swimming hole, but are sidetracked by a lonesome house with a diesel generator. Shortly thereafter they meet Leatherface (Gunnar Hansen), an encounter they will both regret. The first appearance of Leatherface ranks among the most terrifying jump scenes in all of cinema, alongside Jaws’ skeleton appearance and Psycho’s stair-top murder. The rest of the film is primarily running and screaming, and involves a bizarre dinner table scene with Leatherface’s family. Many viewers may be put off by the final half hour, which is an intense visual and auditory assault on the senses. But taking a step back it becomes evident that the film mirrors the action: chaos reigns. Surprisingly, there are only four on-screen deaths in the film. Like Psycho’s famous shower scene, none of them portrays graphic violence. Each one is terrifyingly disturbing. The Texas Chain Saw Massacre is the ultimate exercise in restraint as the key to terror. The sound design is superb, adding more to the gruesome murders than any amount of visual addition might be able to accomplish. 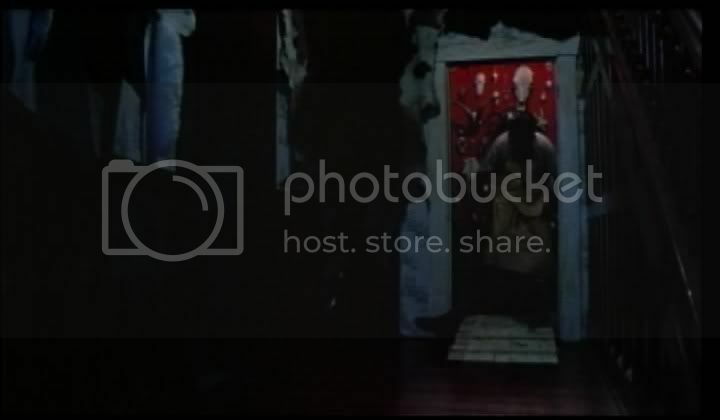 A scene involving a meat hook is particularly flinch-inducing. But nothing is explicitly shown. Sound effects and the mere concept of what’s happening is more than enough to frighten the audience. The film as a whole is an unblinking look at some of the most primal human emotions, but it never appears pretentious (a claim some audiences may level at Antichrist [review here]). The Texas Chain Saw Massacre is simple and uncomplicated, and never pretends to be anything more than a simple story exposing what people consider truly terrifying. The film is a horror masterpiece, a seminal moment in the history of the genre. Today it holds up as atmospheric and horrifying, a simple look into the darkest depths of the human experience. Its devolution into pure madness only reinforces its main themes, though some audiences may be annoyed by Burns’ constant screaming. Watched alone, in the dark, with the volume up, hardly any other horror film can compare with The Texas Chain Saw Massacre. This entry was posted in 3.5 stars, 4 pirate flags, Movie Reviews, Movies I Truly Love, Pirate Flag Rating, Star Rating, T on October 6, 2010 by Tim Irwin.